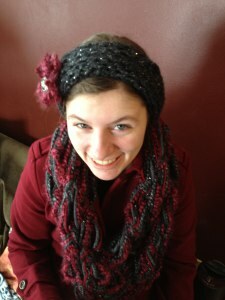 I’m Marie Segares from Underground Crafter. 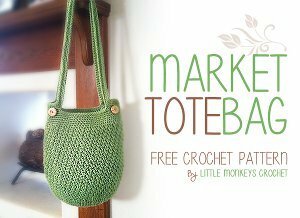 A few weeks ago I posted a roundup of 20+ Free Knit Bag Patterns, and I decided to share a crochet version today! 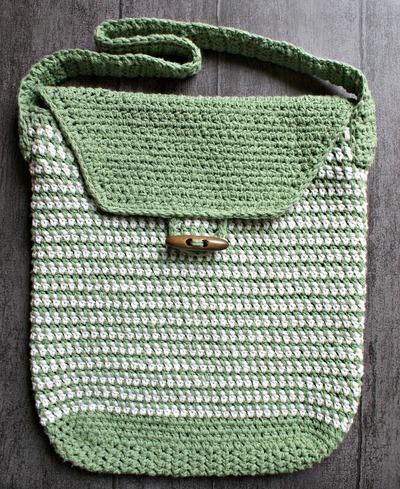 Crochet bags are super fun to make and use. 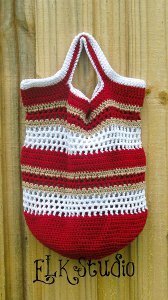 I especially love to crochet bags as the weather gets warmer because they’re portable and can be used year round. Here are some great patterns to start hooking! 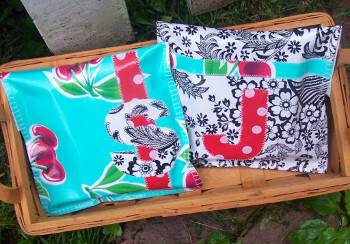 These 3 patterns for small bags can be worked up quickly and used all summer long. 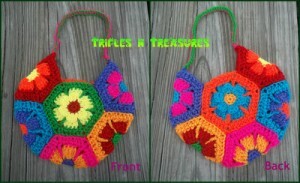 Flower Child Crochet Bag, free pattern by Tera Kulling/Trifles N Treasures. The Flower Child Crochet Bag by Tera Kulling is a bright and festive project made with hexagons that are joined together. This project is a great stashbuster! Precious Owl Pouch. This image courtesy of 1dogwoof.com. 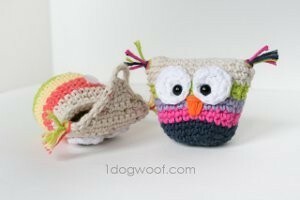 The Precious Owl Pouch by One Dog Woof is a fun project that makes a great gift pouch or notions holder. A Creative Case for Crochet Hooks. This image courtesy of Red Heart Yarns. 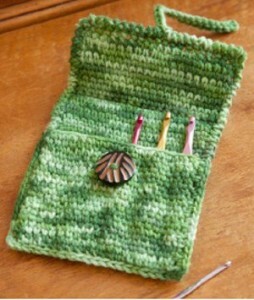 Round up all your hooks and bring them along on your vacation with A Creative Case for Crochet Hooks by Kim Kotary! Make the case in the spring and you can start using it right away. Summer is a great time for visiting Farmers Markets and strolling on the boardwalk. 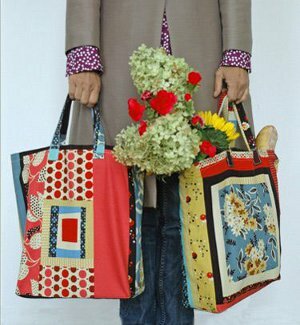 Bring along any one of these 5 market bags for an impromptu shopping spree! Sturdiest EVER Crochet Market Bag. This image courtesy of simplycollectiblecrochet.com. 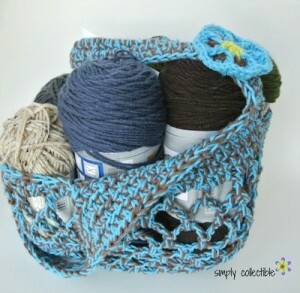 The Sturdiest EVER Crochet Market Bag by Simply Collectible Crochet is crocheted holding two strands of yarn together. This bag is just right for anyone living in an area with a plastic bag ban. Magical Market Bag. 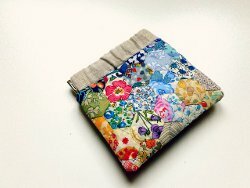 This image courtesy of littlemonkeyscrochet.com. 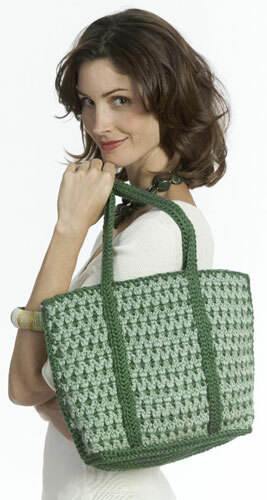 The Magical Market Bag by Rebecca Langford is crocheted in the round and features button closure details. Hobo Farmers Market Bag. This image courtesy of cre8tioncrochet.com. 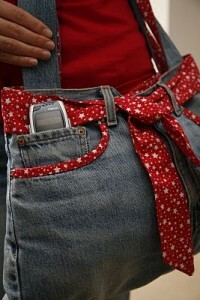 Lorene Eppolite’s Hobo Farmers Market Bag adds a stylish twist to a classic market bag. Two Hour Tote. This image courtesy of daisycottagedesigns.net. Personalize your market bag with the Two Hour Tote by Lauren Brown, which includes a lovely flower applique. Sunrise Market Tote. This image courtesy of calleighsclips.blogspot.com. 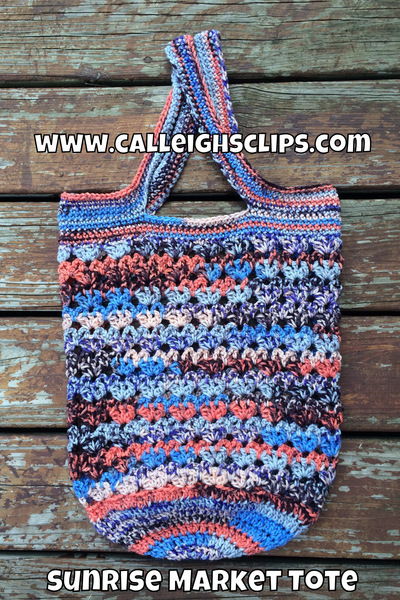 The Sunrise Market Tote by Calleigh’s Clips & Crochet Creations makes a sturdy market bag perfect for carrying heavier produce. These eight bags are attractive and sturdy, whether you’re going to the beach for the day or packing some reading for your vacation. 2-Tone Tote. This image courtesy of Caron Yarns. 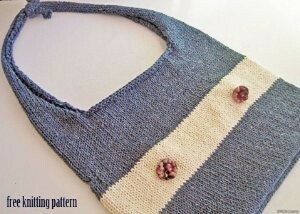 The 2-Tone Tote by Mary E. Nolfi for Caron Yarns includes detailed instructions for assembly and lining with felt. Fun in the Sun Beach Bag. This image courtesy of elkstudiohandcraftedcrochetdesigns.com. 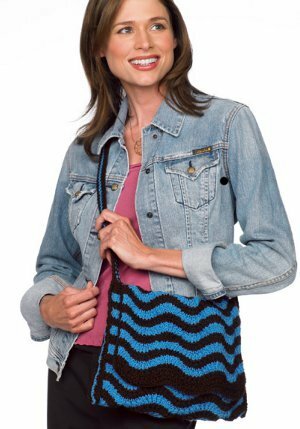 The Fun in the Sun Beach Bag by Kathy Lashley features lively stripes to brighten up a trip to the beach. Genius Crochet Bag. This image courtesy of crochetchiq.blogspot.com. 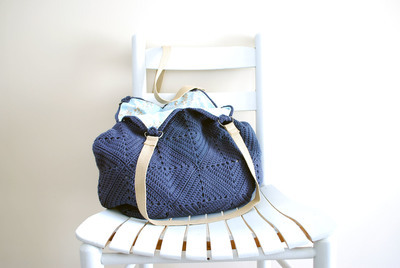 Mary Kathryn Vaughn’s Genius Crochet Bag is a perfect project for carrying your books or magazines to and from home. Amazing Grace Crochet Tote. 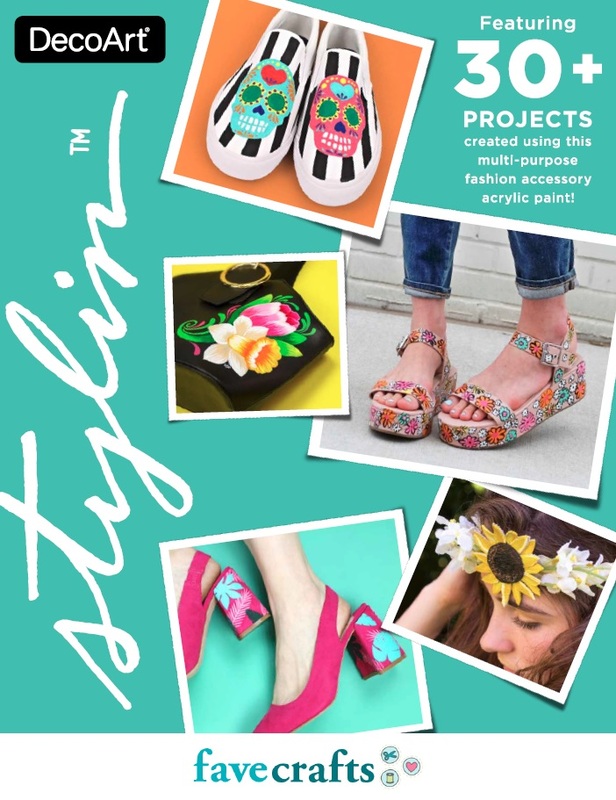 This image courtesy of beatriceryandesigns.com. The Amazing Grace Crochet Tote pattern by Beatrice Ryan Designs includes helpful assembly photos and detailed instructions for attaching the handles. Autumn Day Tote. This image courtesy of bhookedcrochet.com. 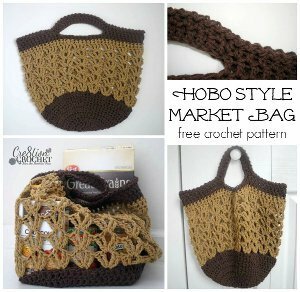 The Autumn Day Tote by b.hooked Crochet is made up of granny squares. 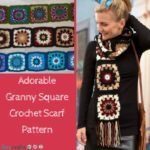 The pattern includes video tutorials and a stitch symbol chart. 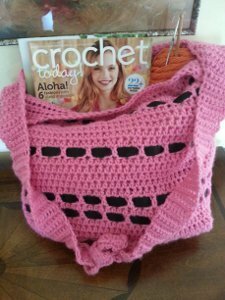 Work Satchel Crochet Bag Pattern. This image courtesy of oombawkadesigncrochet.com. 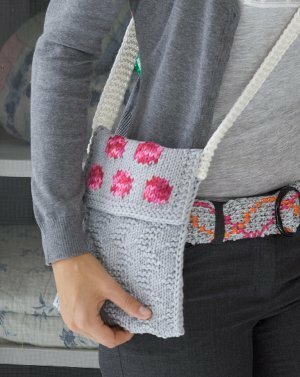 The Work Satchel Crochet Bag by Rhondda Mol includes helpful photos to guide in assembly and tips for reinforcing the bottom of the bag. 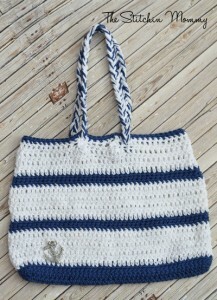 Crochet Nautical Tote. 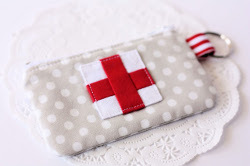 This image courtesy of thestitchinmommy.com. Are you looking for the the perfect beach bag? 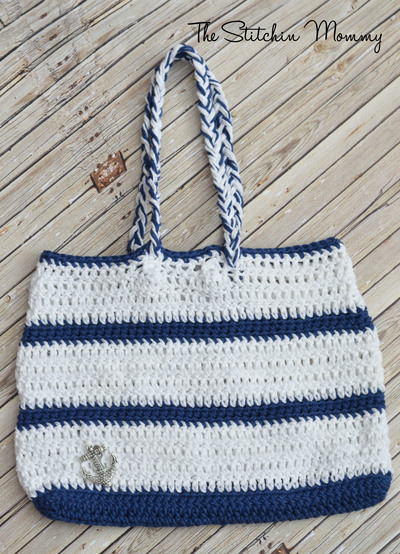 Try out Amy Ramnarine’s Crochet Nautical Tote with braided handles. Cute Kittens Crochet Tote. This image courtesy of poshpoochdesigns.com. Sara Sach’s Cute Kittens Crochet Tote combines stitches to create what looks like small cat faces. 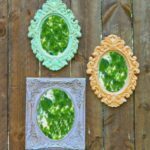 This project is perfect for your favorite “crazy cat lady,” like me! No one wants to carry heavy bags in the summer. These 14 clutches and purses are great for carrying just the essentials. Gotta Go Crochet Clutch. This image courtesy of pattern-paradise.com. 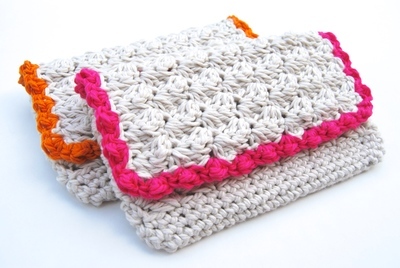 The Gotta Go Crochet Clutch by Maria Bittner is a great clutch for carrying your essentials. 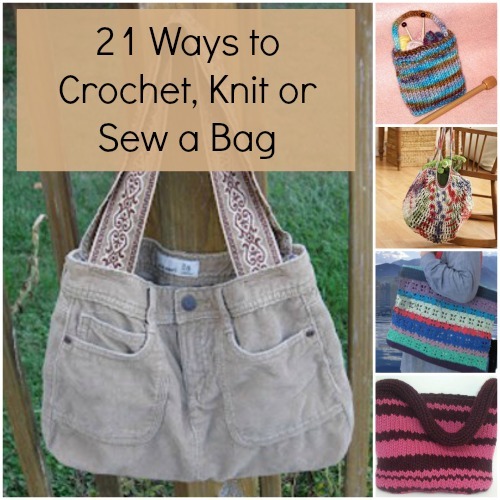 It would also make a great case for your crochet kit! 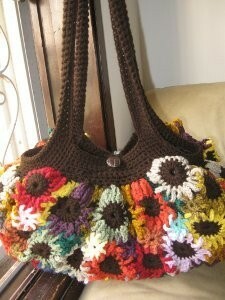 Quirky Crochet Handbag. This image courtesy of crochetdynamite.com. 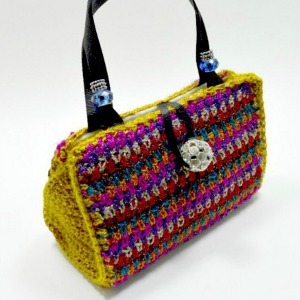 The Quirky Crochet Handbag byJaime Maraia takes the classic handbag for a spin! 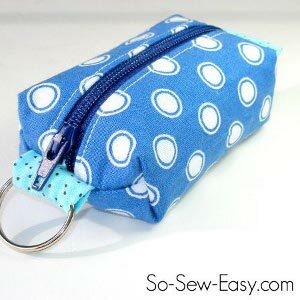 The pattern includes a photo tutorial for making and attaching an interfacing lining and attaching the handles. Mommy and Me Crochet Purse. This image courtesy of mnecrafts.com. 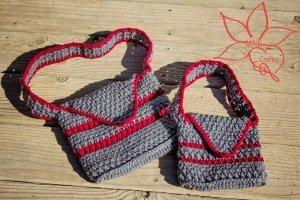 The Mommy and Me Crochet Purse Set by Amanda Evanson is a matching set of purses in child and adult sizes. These are closed with Velcro, making it easy for little hands to open and close. Summer Hobo Bag. This image courtesy of knotyournanascrochet.blogspot.com. The Summer Hobo Bag by Teri Heathcote features a sturdy bamboo handle. The pattern includes a photo tutorial for inserting a fabric lining. Floral Purse. This image courtesy of meladorascreations-com.webs.com. 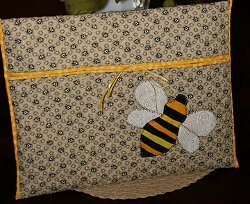 This pattern for this lovely Floral Purse by Meladora’s Creations includes right- and left-handed video tutorials, and a photo tutorial. 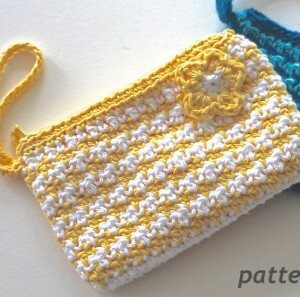 Crochet Envelope Purse. This image courtesy of Kreinik. The Crochet Envelope Purse is a beginner-friendly pattern by Chris Adams for Kreinik crocheted with ribbon for a sturdy shape. Cable Purse. This image courtesy of Caron Yarns. 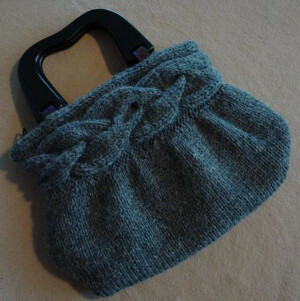 If you like cables, you’ll love the Cable Purse by Deb Richey for Caron Yarn! Tunisian Crochet Crescent Bag. This image courtesy of crochetkim.com. 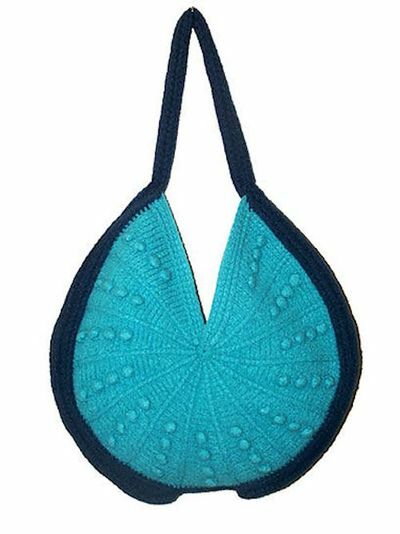 This stunning purse, the Tunisian Crochet Crescent Bag, by Kim Guzman is felted (fulled) after crocheting to give it added strength. 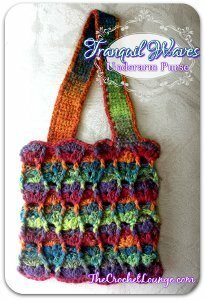 Sunset Waves Crochet Purse. This image courtesy of thecrochetlounge.com. 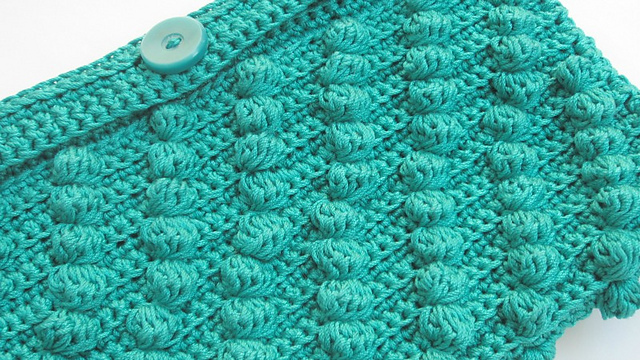 The Sunset Waves Crochet Purse by “e” Lee is a delightful one-skein project. Choose a self-striping yarn like the one in the sample to mimic the appearance of stripes without any ends to weave in! Summer Crochet Clutch. This image courtesy of tangledhappy.com/. 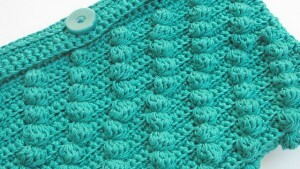 The Summer Crochet Clutch by Sara Freisberg is an Anthropologie-inspired, textured clutch. Personalize it by choosing your favorite color for edging. 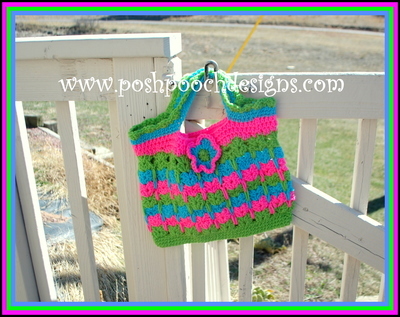 Crochet Shoulder Bag Tutorial. This image courtesy of rebeckahstreasures.com. 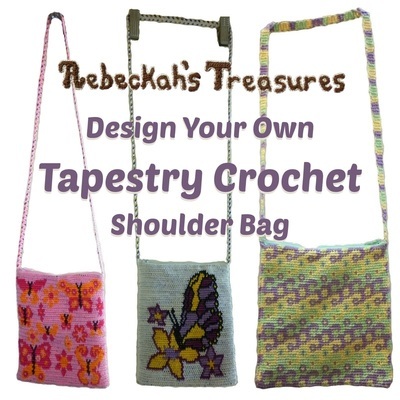 Rebeckah Ferger’s Crochet Shoulder Bag Tutorial is a template for a tapestry crochet bag along with helpful hints for designing your motifs or images. 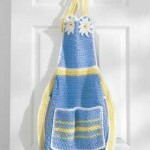 Tapestry crochet is suitable for even beginner crocheters. Snow Queen Ruffled Bag. This image courtesy of crochetaddictuk.com. 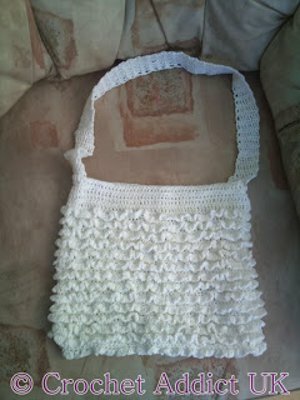 The Snow Queen Crochet Ruffled Bag by Sue from Crochet Addict would look great in white or with vibrant colors on the ruffles. 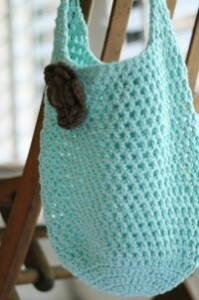 Sea Glass Crochet Bag. This image courtesy of chocolatemintsinajar.com. 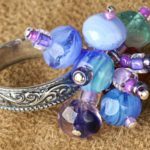 The Sea Glass Crochet Bag by Chocolate Mints in a Jar is made up of granny squares. The pattern includes a construction diagram. Colorful Crochet Clutch. This image courtesy of mooglyblog.com. 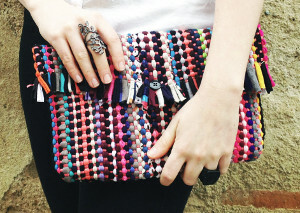 The Colorful Crochet Clutch by Tamara Kelly is a great statement piece. 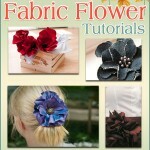 The pattern also includes a photo tutorial for adding a zipper and links to a video tutorial for the special stitch. 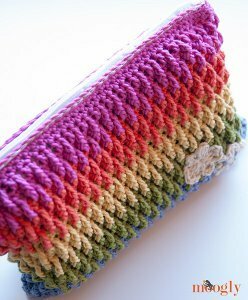 If you like crocheting with cotton thread, check out my free crochet pattern for the Diagonal Bobbles Clutch! 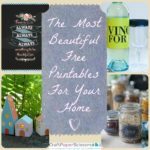 I hope you enjoyed this roundup and that it inspired you to get your hooks ready for summer! 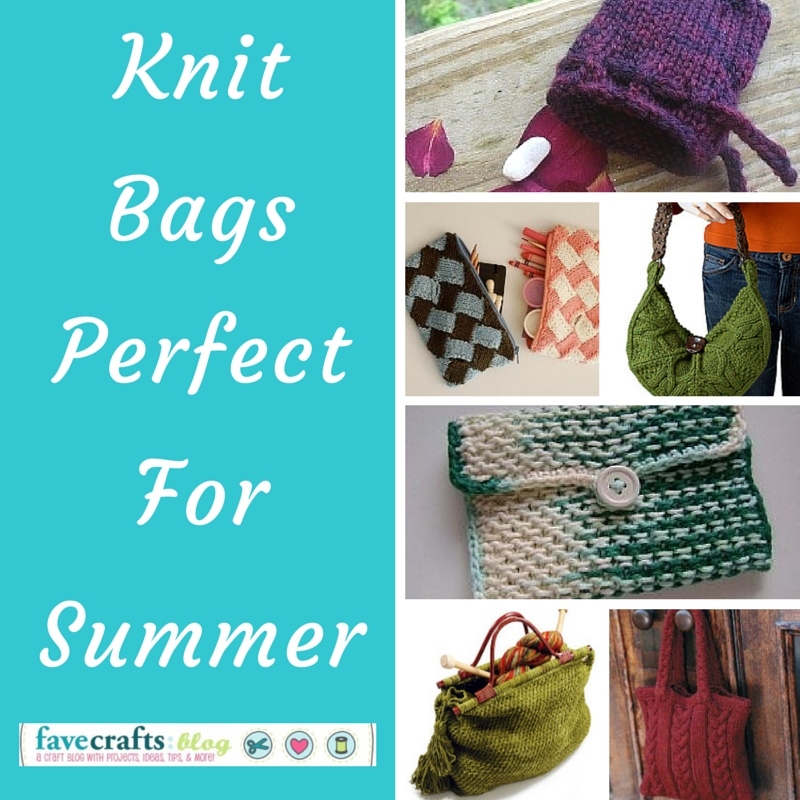 20+ Free Knit Bag Patterns for Summer! 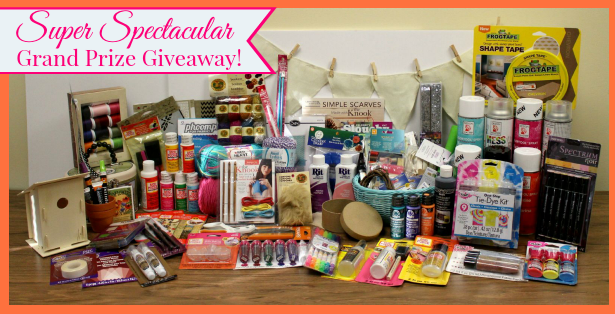 I’m Marie Segares from Underground Crafter and I’m thrilled to share a roundup of knit bags with you today! Whether you’re an old pro or you’re just learning how to knit a bag, there will be something here for you. 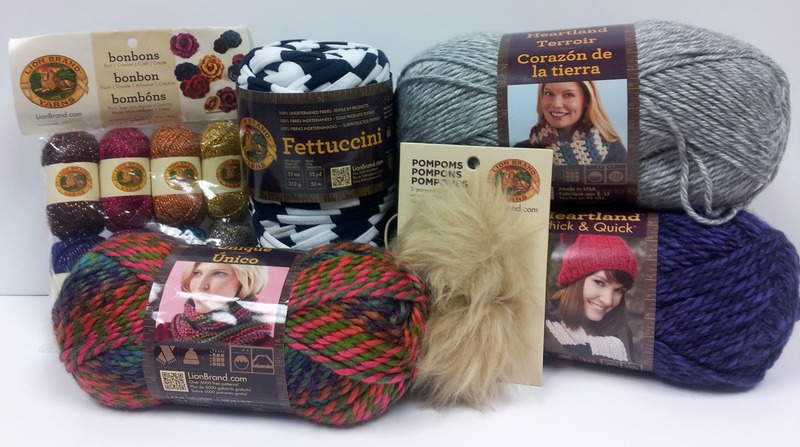 As the weather gets warmer, you may be wondering what to knit. 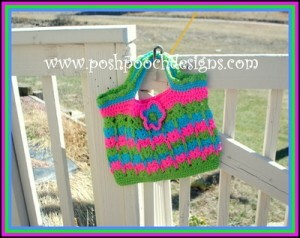 I love working on knit bags in the warmer months. 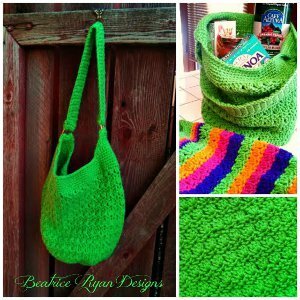 Knit bags are portable so you can bring your work-in-progress to that picnic or barbecue, and they are useful year-round, so you can show them off as soon as you finish knitting! No need to wait ’til Fall. 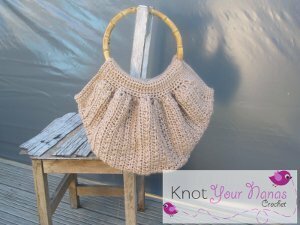 There are many great bag patterns out there, and today I’m sharing more than 20 free knitting patterns that will keep you knitting all spring and summer long! These five bags use simple stitches and make great projects to work on while somewhere slightly distracting. 30 Minute Mixed Berries Bag. This image courtesy of Innerchildcrochet.com. The 30 Minute Mixed Berries Bag by Melissa Mall from Inner Crochet Child is a quick knit using beautiful hand dyed yarn. Chinese Wave Bag. This image courtesy of www.mooglyblog.com. The Chinese Wave Bag by Tamara Kelly/Moogly is a great project for new bag knitters. 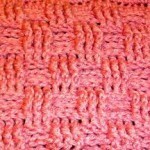 Slip stitches create a firm fabric. 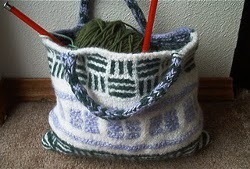 Knit Tote for Knitters. This image courtesy of berroco.com. 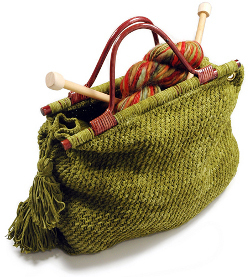 The Knit Tote for Knitters by Donna Yacino for Berroco makes a great project bag. The handles are attached by inserting grommets. Back-to-School Book Bag. 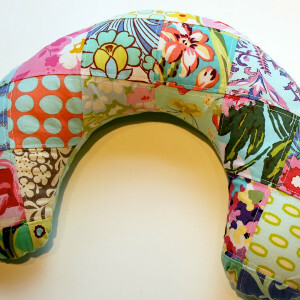 This image courtesy of Craftown.com. 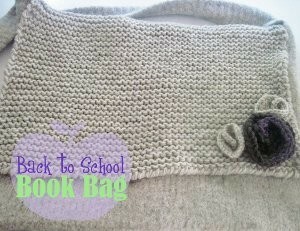 The Back-to-School Book Bag by Melanie Smith for Craftown is a great messenger bag to wear year round. For a more masculine version, omit the rosette detail. Golden Bow Glam Bag. This image courtesy of cvetulka.blogspot.com. 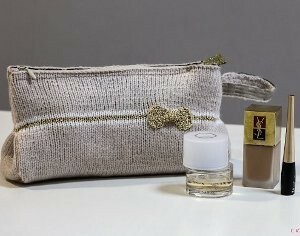 And, if you have travel plans for the summer, be sure to prep by knitting up your own Golden Bow Glam Bag by Cveti from c v e t u l k a knits. 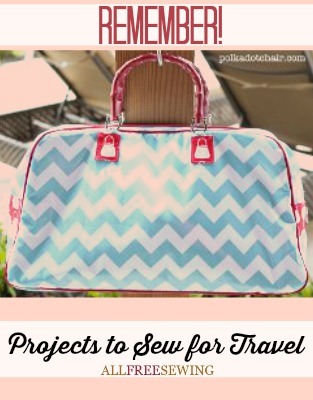 This makes a great makeup bag to include in your luggage! 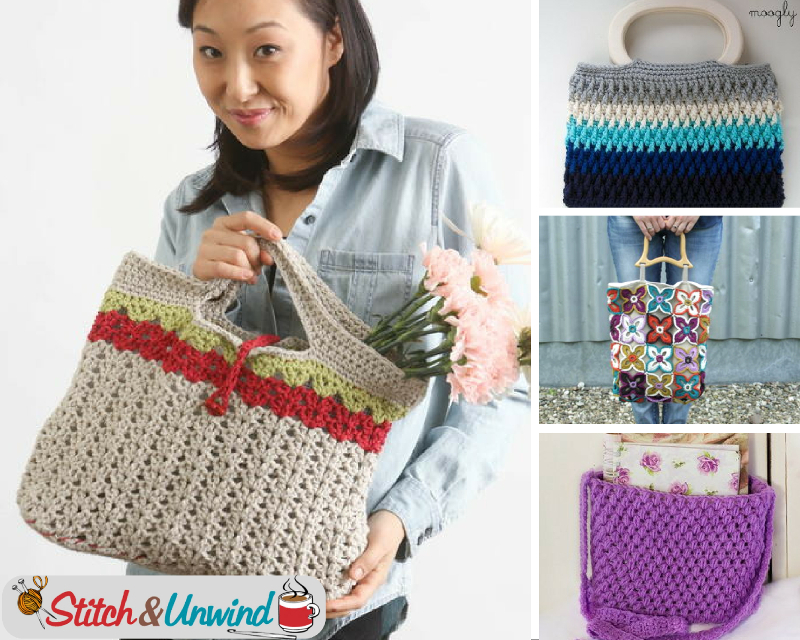 These nine colorful bags will brighten up your needles! Many are also great for using up partial skeins of yarn. 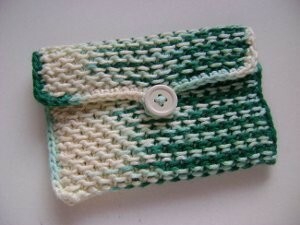 Knitted Weave Clutch by Tagil Perlmutter for Petite Purls. 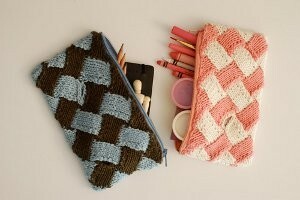 The Knitted Weave Clutch by Tagil Perlmutter for Petite Purls is a great introduction to entrelac. It also includes instructions for adding lining. Farmers Market Bag. 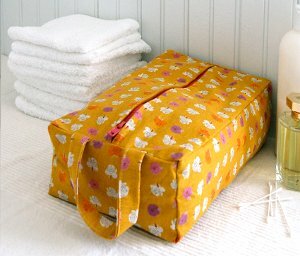 This image courtesy of Craftown.com. The Farmers Market Bag by Melanie Smith for Craftown is the perfect tote to bring with you when shopping for produce at your local farmers market! Boredom Buster Bag. This image courtesy of knittichristi.wordpress.com. 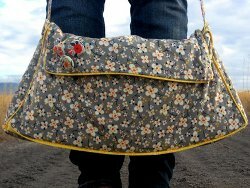 If you want a pattern that keeps both your brain and your hands engaged, try the Boredom Buster Bag by A Simple Stitch. 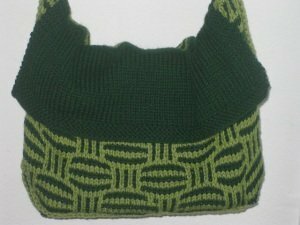 This bag combines cables, moss stitch, and a touch of stranded colorwork to create a stylish accessory. Wavy Messenger Bag. Image courtesy of RedHeart.com. Chevrons add a striking touch to the Wavy Messenger Bag by Michele Thompson for Red Heart. This hands-free storage would also make a fashionable tote for your next knitting project! This image courtesy of RedHeart.com. If you love ripples but prefer shoulder bags, try the Wavy Shoulder Bag by Grace Alexander for Red Heart. Easy Rose Petal Purse. This image courtesy of redheart.com. The Easy Rose Petal Purse by Linda Cyr for Red Heart is a great way to practice a color motif on a small project. 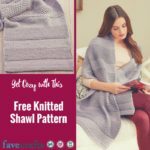 The textured stitch pattern will also keep your interest! 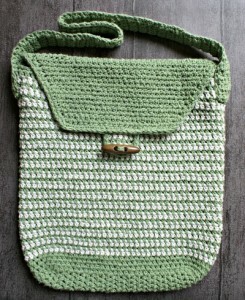 Slip Stitch Mini Tote. This image courtesy of orangefishknits.blogspot.com. 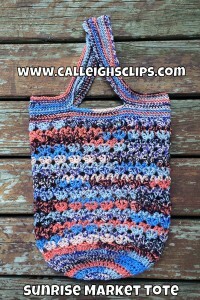 The Slip Stitch Mini Tote by Orange Fish Knits uses slip stitches to create complex looking color work while only using one color per row. This pattern is also felted. 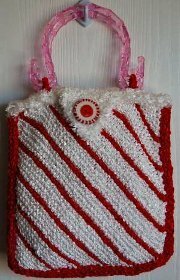 Striped Peppermint Bag. This image courtesy of straw.com. The Striped Peppermint Bag by Terry L. Ross for Crystal Palace Yarns is knit on the bias to create lovely diagonal stripes. Try contrasting colors for the decorative button and handles for a different look. Asthore Bag. This image courtesy of knittichristi.files.wordpress.com. The Asthore Bag by A Simple Stitch also uses slip stitches to create this dynamic pattern. 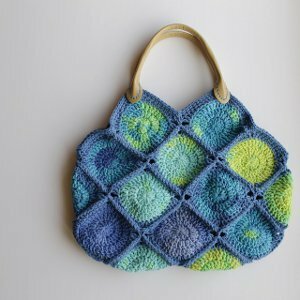 If you love the look of knit cables as much as I do, you’ll love these six patterns for stunning knit bags! Brea Bag. This image courtesy of berroco.com. 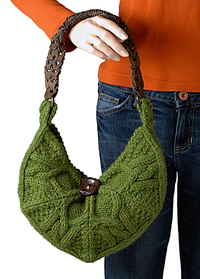 The Brea Bag by Norah Gaughan for Berroco is a striking cabled purse with a unique shape. The Ultimate Bag. This image courtesy of krazyawesome.com. If you’re looking for a cable to take center stage, you may enjoy The Ultimate Bag by Jennifer from The Knit Monster. Purple Purse. This image courtesy of yarnspirations.com. 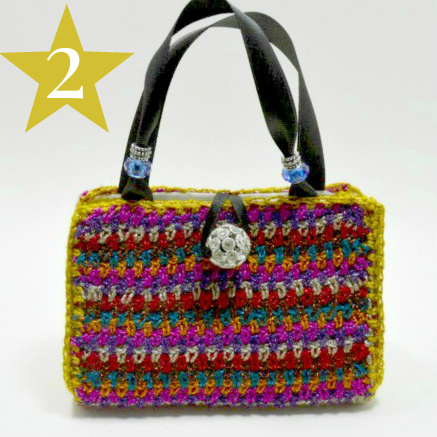 The Purple Purse by Patons uses a chunky yarn to make that central cable pop! This also works as a unisex messenger bag when knit with a different color yarn. Cabled Bag. This image courtesy of http://www.vogueknitting.com. 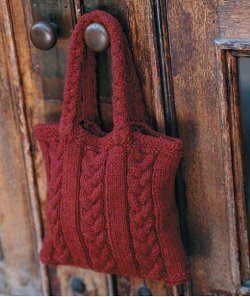 The Cabled Bag by Linda Cyr for Vogue Knitting also uses a chunky yarn to create plump cables. If you don’t like purling, you’ll enjoy that this bag is knit in the round! Cabled Boho Bag. This image courtesy of mydreamsweetlove.blogspot.com. 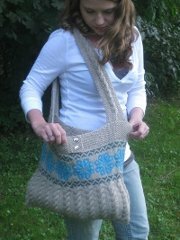 The Cabled Boho Bag by Amanda Reed features several cable patterns for a delightfully textured look. 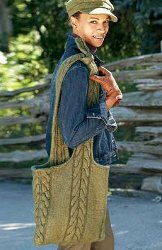 The Leafy Cable Bag by Patons is another great unisex project that features a dramatic cabled strap. 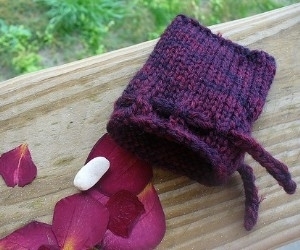 This pattern also includes instructions for felting. These three patterns are finished by felting (or fulling) the yarn, so no lining is necessary. If you substitute yarn, remember to use an untreated wool for best results! 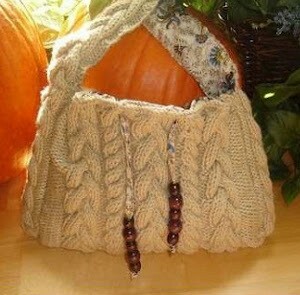 The Felted 2 Color Bag by Premier Yarns is a great beginner project. The color blocked design makes a great fashion impact, too! 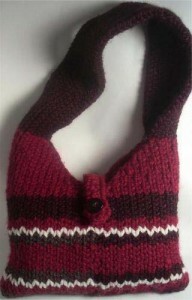 Premier Yarns has another great beginner knitting project, the Felted Striped Bag. The stripes make a dramatic statement, but are really simple to knit. Rose Tote Bag. This image courtesy of silkaburgoyne.com. 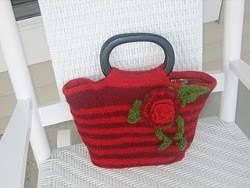 The Rose Tote Bag by Koleido by Silkie B. also features stripes, but it also includes a lovely rose embellishments, along with detailed instructions for felting to maintain the shape of the flower! 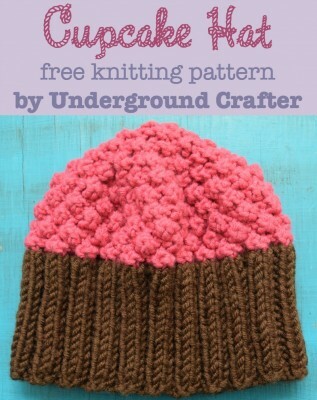 If you’re looking for a different portable project for the warmer months, you may also enjoy my free Cupcake Hat pattern in newborn, infant, and toddler sizes. 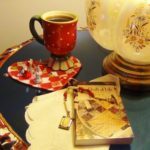 I hope you enjoyed this roundup and that it inspired you to cast on! Going to the beach is right up there with barbeques, outdoor concerts, and fireworks when it comes to the quintessential summer activities. 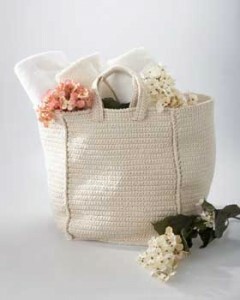 If you are a total beach babe, you know that having the perfect beach bag can make or break your day at the beach. A bag that is too hefty or too small can mean a lot of inconvenience. That is why we have collected these tutorials that will show you exactly how to sew a bag that is perfect for some fun in the sun. 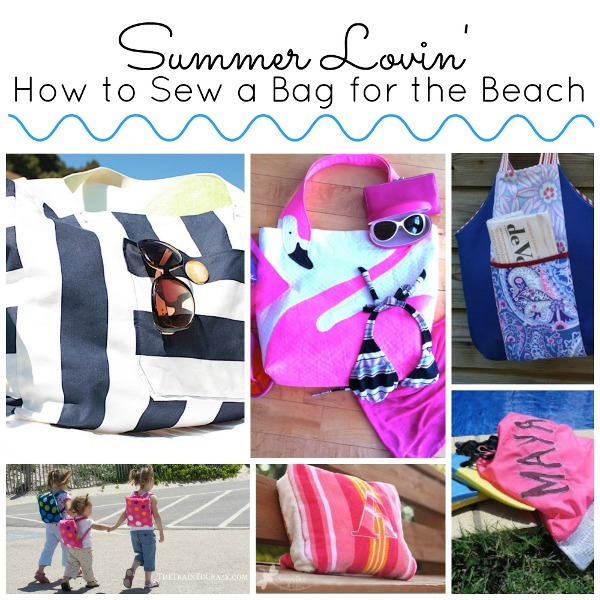 Summer Lovin’: How to Sew a Bag for the Beach has everything you need to create a beach bag you will love and adore for many, many summers to come. My favorite beach bag is a tote bag I purchased long ago. It is old enough to get sandy, sturdy enough to stand upright on my towel, and big enough to carry all of my essentials. I have a hard time finding the right size bag. If a bag is too big, I end up filling it with things I insist I might need at the beach. This means I’m lugging a heavy bag with a few too many books, some snorkeling equipment I won’t be using, and sometimes even my phone charger. 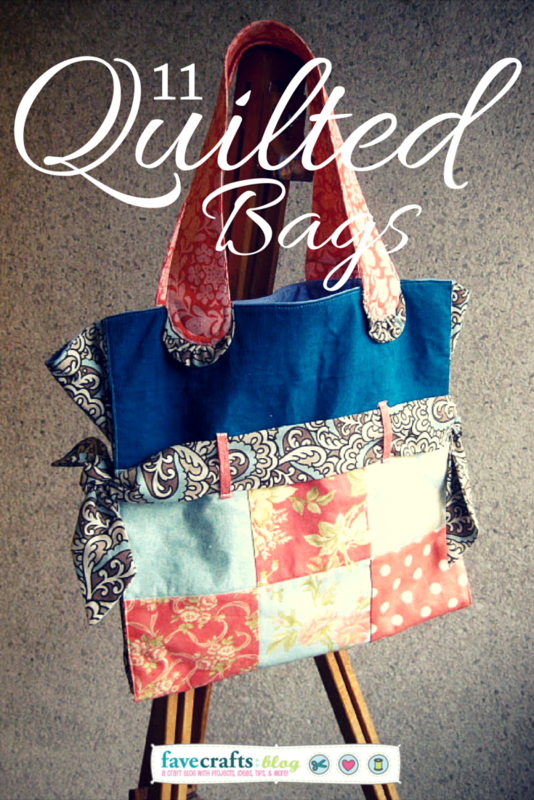 All of these patterns show you how to sew a bag that is the perfect size for your essentials. So, sew one of these up, pack up your beach towel, sunscreen, sunglasses, favorite guilty pleasure reading material, and any other essentials, and get ready to get your tan on. 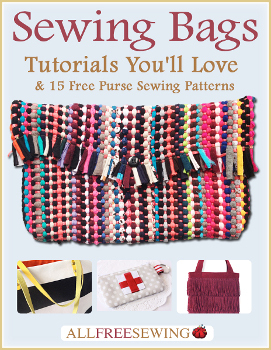 If you adore these bags and want to learn how to sew a bag for any occasion, check out 27 Patterns to Sew Purses + 6 New Coin Purses and our Sewing Bags: Tutorial’s You’ll Love & 15 Free Purse Sewing Patterns eBook. Are you an active beach-goer or a sleep in the sun beach-goer?